Though some boycott the company, or simply refuse any online dealer, this one fact remains: if you use the Amazon programs to their full potential, it will help you to sell your work – not just through Amazon, but in general. The reason for this is Google, and the way they prioritize search engine results. If you are looking for a book or a person, Amazon and Wikipedia results will always be at the top whenever possible. If you want people to be able to search for your name or your titles, then you must absolutely have an Author’s Page a.k.a. Author’s Profile on Amazon. 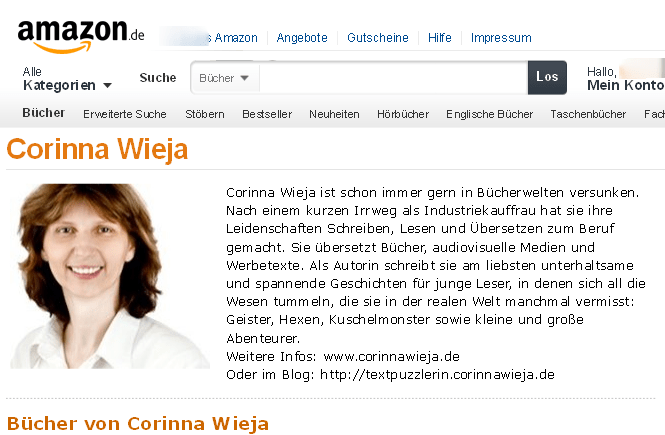 A large number of authors and illustrators do not provide readers with a complete Profile on Amazon. If you don’t know what this is or how to find such a thing, first visit Amazon and find a listing for any book listed there. Note that the Author’s Name located directly under the Book Title is actually a link. If you click on that, it will bring you to a page all about that author – or at least everything Amazon knows about the author. For many authors and illustrators, these pages are incomplete because this is something the actual creator has to do – not the publisher. The publisher gets your book listed and salable for the Amazon platform (and others), but the creators are responsible for the bells and whistles when it comes to marketing and this includes Profiles (and a lot of other stuff, too). If the writer has done their marketing-homework, you’ll find their promotional picture, a biography, and a complete listing of all the books they have on the market. The same is true for Illustrators and Editors. Make sure that all your titles are mentioned on that list, because sometimes titles get misfiled on the site and are excluded from the right credit list. You should claim all editions of the titles as well – be they Kindle Books, physical books, audio books, or any other format (even APPS). Make this information available to Amazon Customers and you will make it that much easier for them to find out about you and your other projects. If you are a published writer &/or illustrator, your book is listed on Amazon. If by some strange happenstance it isn’t, you should definitely contact your publisher and ask them why. Author Central makes it also easy to link together the different editions of your book. Simply contact Amazon via https://authorcentral.amazon.com/gp/help/contact-us. Then, under “Select an issue,” select My Books. Under “Select details,” select Update information about a book. In the field that appears, select “Update something else”. Then choose how you want to contact Amazon about it and after a (hopefully) short period, they will have linked your books together. All of this makes it easier for a person to find and buy your books, or add all your other published titles into their Wish List, which in turn makes that person’s family and close friends also aware of your work. You can easily submit all this information directly on the Amazon website. You do not have to wait for your publisher to do it for you, and you don’t have to beg your editor for instructions. It’s as simple as creating a Profile on any kind of social network (like Facebook, for example). The only difference is that someone checks for validity before the page goes live. The process usually takes about 48 hours. To create your Author Page on Amazon, you just have to go to Author Central. There you can log in with your Amazon.com account (if appropriate). Please note that there are different versions of Author Central for some of the different distribution areas of Amazon. Usually, you need an account separate from your US Author Central account to log into the regional Author Central sites. They might also not have all the features available within the sites. Once you are logged in, you should create a nice biography for yourself with relevant information that makes it easier for your target readership to connect to you. Always upload your picture. The “Author Page URL” gives you the opportunity to have a link to your Author Page that is easy to remember or share. That will usually be http://amazon.com/author/<your name>, but maybe you have several pseudonyms and want an Author Page for each of them. You should also consider linking up your Blog and Twitter feed if you are somewhat active there. Another great feature is the ability to track your book sales in Author Central with a nice, easy to understand graph. You will see exactly how and from where your sales are developing. In summary, Amazon Author Central gives you many nice features to promote yourself and your work, track your sales and connect with your audience. You should definitely take advantage of that and make it work for you. Thanks for this post. Very informative. 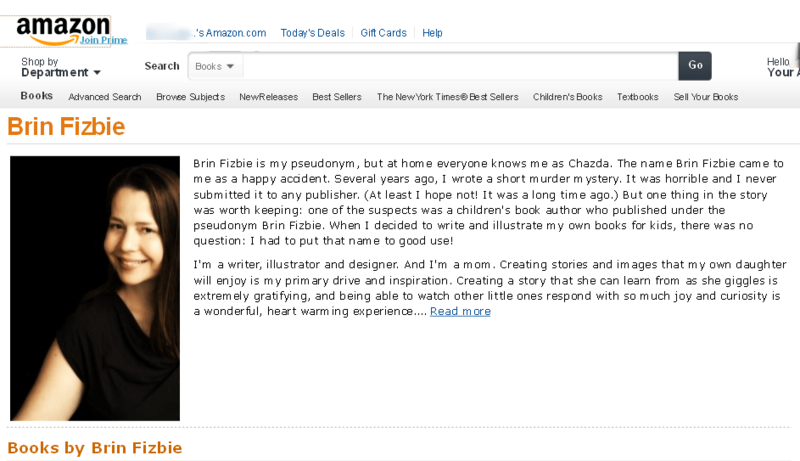 I’m not sure how to make an author page on Amazon, when I’m only the illustrator. I tried going through author central, but have to claim the book as the author, and I can’t do that, since I’m not the author. So, how can an illustrator have an “author” page, without being the author of a book? Now to your questions: if you are the Illustrator of a book, you can still claim it as a “different kind of contributor”. Amazon Support staff will then decide on a case by case basis, if your contribution to the book warrants you claiming it and being listed. If you are the illustrator for a heavily illustrated book (for example a children’s book), you shouldn’t have a problem. I can’t make an author account, without confirming my identity as an author on Amazon. Which is impossible. Below the text is a two books I’ve illlustrated, but when I click on them, I get only one option, and that is to claim that I’m the author (which I’m not). I can’t do anything else. I get a very specific “Author name” and a button below “This is me”. And I cannot click that, since it’s not me. So how would I proceed to get an account in author central? Contact Amazon? Okay, I tried clicking the “contact us” button at the same page I got stuck on, and was able to find the things you mentioned above in the comment. So now I’ve sent them an e-mail with the information, and will tell you how it works out. I now have an author page on Amazon.